One recent passport size photograph of the child with his / her parents. A certificate from a registered medical practitioner stating the child’s physical condition and dates of immunization against infectious or contagious diseases and indicating allergies or recurring illnesses, if any, along with a photocopy of the immunization card. A self-addressed stamped envelop with the child’s name and address clearly written on it. 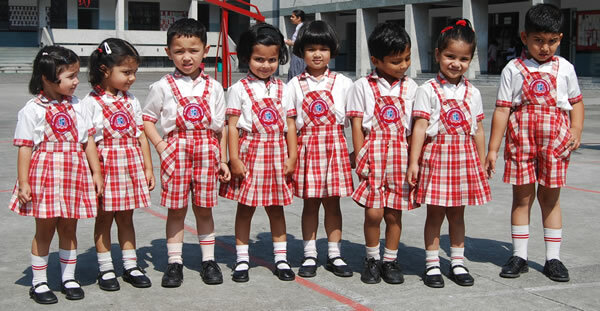 No child less than 3 years of age or more than 4 years of age by the beginning of the academic year will be admitted to L.K.G. The course of study / the stream in class XI is not automatic. The choice of group (Science / Commerce) and the subject shall be offered to the students on the basis of their performance in the ICSE examinations. The criteria or the cut-off percentage will vary from year to year, depending upon the overall results of the students in the relevant subjects in the ICSE Examination. The admission fee, annual fee, security deposit and the first installment of the tuition fees must be paid in advance to complete the admission formalities. After the completion of the admission process, no fees will be refunded under any circumstance or situations. All admissions will be strictly on the merit of the candidates. Any effort to seek admission by offering donation to the school or by some recommendation will debar a student from getting admission. The School Management reserves to itself, the right to admit or refuse pupils seeking admission to the school without furnishing any reasons whatsoever. Similarly, the management decides when the question of retaining a student in the class arrives. Copyright @ Stjosephacademy 2019 All Rights Reserved.